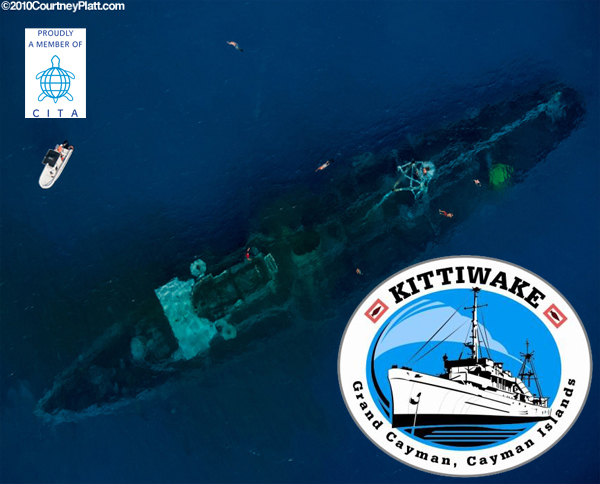 As of Saturday January 8th 2011 The USS Kittiwake in the Grand Cayman waters is available for diving and snorkeling! Price: US$2625 for exclusive private yacht charter/ Includes Marine Park fee and Kittiwake snorkeling wristbands. Inclusion: Kittiwake snorkeling, snorkel gear/vests, wave-runner, water-skiing, wakeboarding, light snacks, water/soft drink beverages. We are one of the supporters of CITA member in bringing the Kittiwake to Cayman. The photos are of the clean up crew prior to the sinking. Kittiwake Sinking – She Landed Straight Up! The Kittiwake had an illustrious service for over 54 years, being decommissioned September 30, 1994. After being laid up by the US Navy for 6 years, the Kittiwake was transferred to the US Maritime Administration (MARAD) in March of 2000. From 2000 – 2009, she resided at the James River Reserve Fleet in Fort Eustis, Virginia (Norfolk area). The Kittiwake was transferred from MARAD to the Cayman Islands Government in August 2009 and was cleaned and remediated in Norfolk, Virginia to become an artificial reef. This included substantial work including the removal of all hazardous materials (like pcb’s, asbestos, mercury, cabling, wires, oils, lubricants and a very long list). Additionally, all thin or loose materials that could break off during or soon after sinking were removed. The Kittiwake is possibly the ‘cleanest’ wreck even to be sunk as an artificial reef. 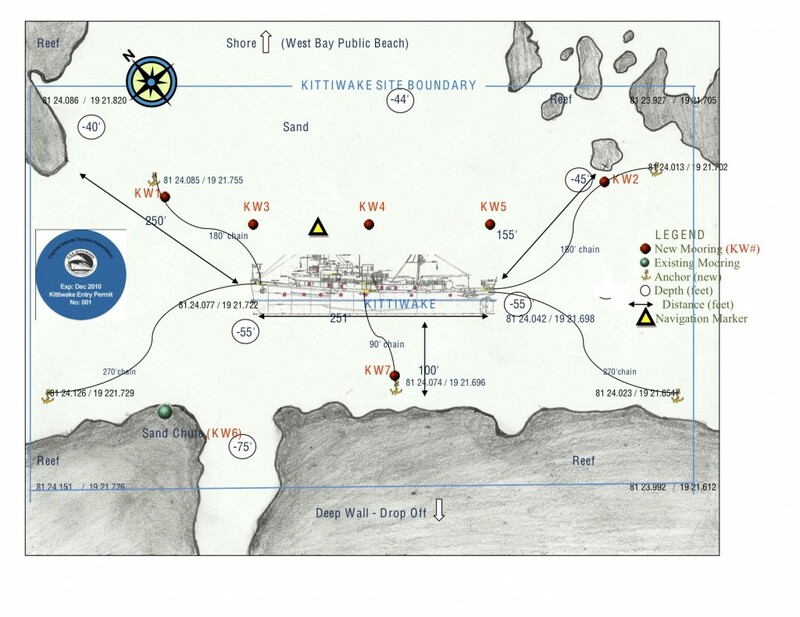 As you can see, the location for the Kittiwake marine park is at the northern end of Seven Mile Beach, on the West or lee side of Grand Cayman at latitude 19 21.714’N and Longitude 081 24.073’W for her bow, just off of the Sand Chute Dive site. The bottom is flat and sandy. The Kittiwake rests 64 feet deep at the bottom and be only 15 feet from the surface, ideal for both divers and snorkelers. Scuba Divers will be issued a tag to attach to their BCD or Regulator. Snorkelers will be issued with a wrist band. The funds collected are used for maintenance of the ship wreck, safety equipment and management of the attraction. A portion of the visitor fee is paid to an Environmental Contingency Fund. Individuals who visit the attraction without paying the fee or are not wearing the Medallion / wristband will be reported as trespassing to the Cayman Islands Authorities.